Joseph and Christabel Lumbasi displaying the visa applications. 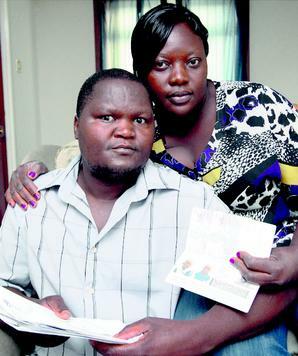 A KENYAN couple living in Angus have become trapped in a heartbreaking visa nightmare which has left their two young sons stranded thousands of miles away in East Africa. This week was to have finally been the start of a new family life together in Scotland for youth worker Joseph Lumbasi and wife Christabel following a trip to their homeland to bring their boys Lance (6) and Leslie (4) to Forfar after years apart. The Lumbasis have built a new life in Tayside in the three years since Joseph arrived in this country to complete a masters degree at St Andrews University, working hard to build up the funds required by the authorities to unlock the door to their dependants. A month ago the devoted couple returned to Western Kenya for an emotional reunion with the youngsters, for what they believed would be the realisation of their dream of a new beginning together. Instead their visa applications for the boys were blocked, leaving the couple forced to take the heart-wrenching decision to sneak away in the dead of night on a solemn journey back to Scotland. The parting has been so painful that neither parent has been able to bring themself to speak directly to the distraught children, who remain in the care of Christabel’s mother but cannot understand why the promise their parents made has not been fulfilled. Exhausted emotionally and physically at the weekend after their arrival home in Restenneth Drive, Forfar, Joseph said he and his wife would now try to put aside their dreadful pain to find support for a visa appeal application, which must be lodged within 28 days. The circumstances which have left the family in limbo centre on the amount of money immigration authorities require families to have in their bank account before their dependants can come to live in the UK. He gained a post with Dundee abuse support charity Izzy’s Promise as a development worker and recently successfully applied for general migrant status, which became effective for three years. Christabel later joined her husband in this country and for the past year and a half has been working in a Fife care home. The couple believed the immigration rules required them to provide proof of a bank account with just over £1800 in it to secure Lance and Leslie’s entry into the UK but the authorities have said the sum must be £4000 —a level which Joseph claims does not apply. He said, “The visa refusal says the sum in the bank account should be £4000—£1600 for each of the children and £800 for the father —but we believe the rules say that if you have been here for more than 12 months it brings it down and that is why we arranged to go back to collect them because we knew we had proof in our bank account. “We followed the normal procedure of applying for dependants. We had bank statements, marriage certificate, proof of residency and everything we thought we needed and we were so sure it was going to go through. He added, “To everyone we are liars. The Border Agency think we are liars because they do not believe what we told them and our boys say, ‘Why did you lie to us? You said you would be taking us with you’. “We were very excited when we were going home because we knew we would be bringing our boys back. “Friends have been calling us and asking how the boys are and if they are excited to be here and we just have to tell them what has happened. “We had to hide them when we were leaving because they knew they would start crying. It was very distressing. Christabel said, “We were confident that 2010 would be the year we would be together. “That is what we had planned and we are not a family now. We got this house to be with our boys. “When we are together we just sit here and we don’t even talk to each other. Christabel has spoken to her mother since the couple arrived back in Scotland but cannot bring herself to talk to her sons on the phone. The UK Border Agency in Glasgow and the Home Office were unavailable for comment last night but in similar situations have said they do not discuss individual cases. The couple said they would be making contact with their local MP and MSP in an attempt to gain help which may resolve their plight. This entry was posted on February 15, 2010 at 5:21 AM	and is filed under Diaspora News. You can follow any responses to this entry through the RSS 2.0 feed. Both comments and pings are currently closed.